Summers County birth, death, and marriage records are available from the West Virginia Health Statistics Center for $12 (in most cases). With few exceptions, public records include birth records older than 100 years and death and marriage records older than 50 years. For divorce records, contact the Summers County Clerk, who also maintains pre-1917 birth, death, and marriage records. 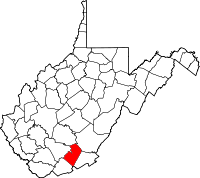 Summers County was created in 1871 from Fayette, Greenbrier, Mercer, and Monroe Counties and named for George W. Summers, who represented Kanawha County in the General Assembly and served as a judge in Virginia. Representing Kanawha County, he opposed the Ordinance of Secession in the Virginia Convention.